In the USA many people demonstrate against president-elect Donald Trump, with the slogan ‘Not my president’. Something similar happens in South Korea, as this photo shows. Authorities found the pills – usually used to treat erectile dysfunction – while investigating corruption allegations against Ms Park. The presidential office confirmed it bought 364 Viagra and similar generic pills to deal with altitude sickness on official trips to East Africa, … . The BBC’s Stephen Evans in Seoul says the discovery of Viagra will add an air of remoteness to the president. Many Koreans believe Ms Park is living in a “different world” which will exacerbate political pressure on her to resign. Ms Choi, a long-time friend of Ms Park’s, is the daughter of Choi Tae-min, a shadowy quasi-religious leader [of the Church of Eternal Life] who was closely linked to Ms Park’s father, then-president [dictator] Park Chung-hee. South Korean Political Crisis Hits President’s Approval Rating, Consumer Confidence. 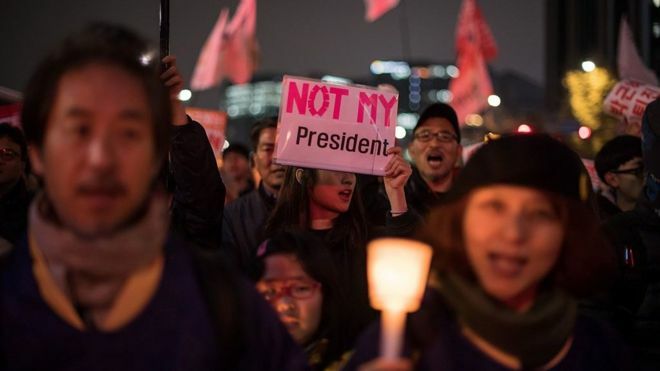 President Park Geun-hye’s approval rating fell to 4 percent amid a deepening political crisis, marking an all-time low for any democratically elected leader in the country: here. This entry was posted in Crime, Politics, Religion and tagged Korea by petrel41. Bookmark the permalink.